While it's OK to eat Italian sausage, it's not the type of meat you should eat all the time or in large quantities. Made with pork and flavored with garlic and fennel or anise, Italian sausage -- whether sweet or spicy -- is high in calories, fat and sodium. Knowing the nutrition information for 1 pound of Italian sausage can help you figure out how it might, or might not, work in your diet plan. One pound of Italian sausage contains 1,463 calories. On average, adult women need anywhere from 1,600 to 2,400 calories a day, and adult men need 2,000 to 3,000 calories a day. So 1 pound of sausage meets almost all or at least half your daily calorie needs. Even if you eat a reasonable 3.5-ounce portion, it still has 323 calories. Compared to a lean meat such as white meat chicken, which has 173 calories in a 3.5-ounce portion, Italian sausage is a high-calorie meat. A 1-pound serving of cooked Italian sausage contains 90 grams of protein. As an animal source of protein, the Italian sausage contains all of the essential amino acids, making it a complete, or high-quality, source of protein. The protein in the sausage is used to maintain and replace the proteins found in your cells, organs and tissues. While you might not eat 1 pound of sausage in one sitting, it more than adequately meets your daily protein needs. It is recommended that women get 46 grams of protein a day and that men consume 56 grams a day. One pound of Italian sausage is also very high in fat and saturated fat, with 116 grams of total fat and 41 grams of saturated fat. The U.S. Department of Agriculture says a diet with 20 percent to 35 percent of calories from total fat and less than 10 percent from saturated fat is associated with a lower risk of cardiovascular disease. If you eat a 2,000-calorie diet, you need to limit your total fat intake to less than 78 grams and saturated fat intake to less than 22 grams. Italian sausage is a high-sodium food, with 4,176 milligrams in a 1-pound serving, or 922 milligrams in a 3.5-ounce serving. The 2010 Dietary Guidelines for Americans recommends limiting sodium intake to less than 2,300 milligrams a day. Getting too much sodium in your diet increases your risk of developing high blood pressure, which in turn increases your risk of heart disease. 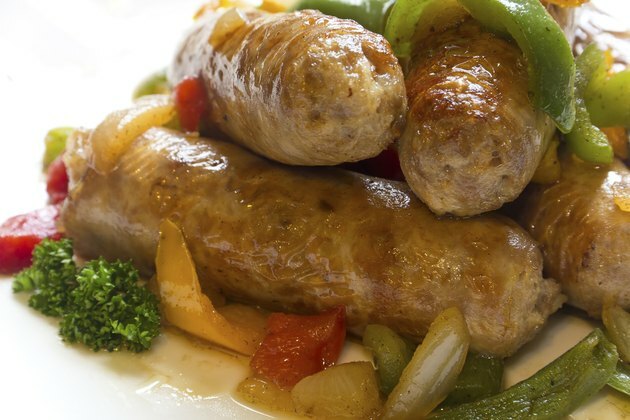 Italian sausage may be high in fat and sodium, but it does provide some essential vitamins and minerals. A 1-pound serving contains 6.7 milligrams of iron, 5.9 micrograms of vitamin B-12 and 10.8 milligrams of zinc. Iron helps your body make hemoglobin and carry oxygen. Zinc helps your body fight off illness and infection and is needed to help your body heal cuts, while vitamin B-12 is necessary for the production of red blood cells and helps maintain your central nervous system. Cookthink: What Is Italian Sausage?